Siem Reap – Cambodia. Siem Reap, is a province located in northwestern Cambodia, on the shores of the Tonle Sap lake. 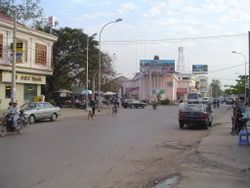 The provincial capital is also called Siem Reap. The name literally means Siamese defeated referring to the victory of the Khmer Empire over the army of the Thai kingdom of Ayutthaya in the 17th Century. Today it is most widely known for being the closest city to the ruins of the temples of Angkor. Sunset views outside the Angkor Wat complex, close to Siem Reap.Located in northwest Cambodia, Siem Reap is the major tourist hub in Cambodia, as it is the closest city to the temples of Angkor. The most recognizable of the temples, Angkor Wat, literally Capital Temple, built by King Suryavarman II the early 12th century provides the largest tourist draw. Recently the city has seen a great deal of expansion, hundreds of hotels, restaurants and shops, catering to both international and Cambodian tourists have opened to serve the influx of visitors. Also, King Norodom Sihamoni and the Cambodian royal family maintain a residence in the town. The Angkor temple complex is north of the city. Other sites of interest near Siem Reap include Angkor Thom built by Jayavarman VII, Banteay Srei, Ta Prohm, as well as hundreds of other temple ruins. Angkor, and the surrounding area that would later become known as Siem Reap, faced repeated invasions from the Thais, and ceased to be the capital after a seven-month siege in 1431. The capital was moved to Phnom Penh in 1432, and then to Lovek and Oudong, before moving back to Phnom Penh in 1866. The temple ruins were visited by Western explorers and missionaries before the 19th century, but Henri Mouhot is generally seen as having “discovered” Angkor Wat in 1860. Fruit vendor at the Siem Reap market.Siem Reap has colonial and Chinese-style architecture in the Old French Quarter, and around the Old Market. In the town, there are Apsara dance performances, craft shops, silk farms, rice-paddy countryside, fishing villages and a bird sanctuary near the Tonle Sap Lake. Siem Reap today, being a popular tourist destination, has a great deal of hotels and restaurants. Mostly smaller establisments are concentrated around the Old Market area, while more expensive hotels are located between Angkor International Airport and the town along National Road 6. There are a variety of mid-range hotels and restaurants along Sivatha, and budget to mid-range hotels in the Phsar Leu area.